:: Where the funeral being a single most important ceremony in the life cycle !! 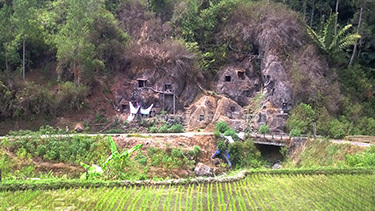 Toraja Land, is known for its unique culture and ancient traditions. The center of tourism is Rantepao, 328 km from Makassar by road (about 8 hours). 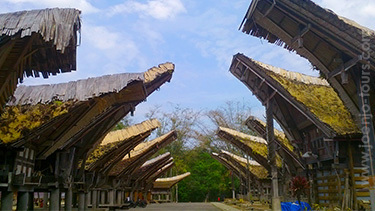 The entry to Tana Toraja is marked by a gate built in traditional boat-shaped architecture. The road passes through the mountains of Kandora and Gandang on which, according to Toraja mythology, the first ancestors of celestial beings descended from heaven. The majority of the people still follows an ancestral cult called "Aluk Todolo" which governs all traditional ceremonies. Torajan culture is a complex blend of ancestor worship and animistic beliefs where rituals for the dead are colorful festivals to pave the way for the soul's entry into the hereafter. This unique culture, the scenic beauty, cool climate and gentle people are the main reason that Toraja is gaining popularity as a tourist destination. The most spectacular of Torajan rituals are the funerals. For Torajan, a funeral is the single most important ceremony in the life cycle. It is based on a strong belief that the soul of the deceased travels to the land of the south and in this land of eternity, he will need all the requisites of everyday life in the hereafter just like when he was alive in this world. Various types of graves are located in Cliffside caves, mountain ledges or in special houses reserved for the dead. The graves in Tana Toraja are made in huge rocks because of their strength and relative safety from animals and thieves. This place is considering as the heart of Tana Toraja. Visit the colorfull Torajan Traditional Market “Pasar Bolu” where you can see locals selling animals for the funeral ceremony such as Buffalo, pig, chicken, also they sell a local spice, fruits etc. Nowadays Rantepao is became as a capital city of North Toraja Regency. Is located around 04 km southeast of Rantepao. One of the most popular tourists sights in the area. It is enchanting with its Tongkonan houses, rice barns and megaliths set among the rice fields. There is an aristocratic cliff burial site with hanging graves and tau-tau that located about a hundred meters at the rear of this village. Is an natural grave stone site, there you can see some ancient bones, hanging coffins, some statues “Tau Tau” and one can also enter the cave. It is situated about 04 km south of Rantepao. Located about 09 km to the south of Rantepao. This site is a cliff burial site of an ancient Torajan chieftain. Galleries of tau-tau guard the graves. Batu Tumonga is the most spectacular area situated on the slope of Sesean mountain, about 25 km from Rantepao . From this mountain you have an extraordinary panorama and overview of Rantepao Town. One can visit the stone grave of Lo’ko’mata, the coffee plantation and enjoy the walks trough the villages. 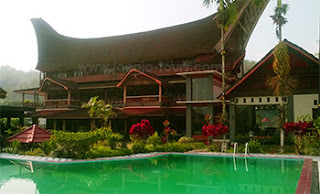 It’s a traditional plait center, located in the district of Sesean about 11 km north of the hotel. It has been known for a long time as an area of traditional weaving “ikat” in Toraja. Is located about 6 km north of Rantepao. There are some stone graves and rante (field of ceremony such as the ritual of death rambu solo’) where menhir (simbuang) is constructed. Is located in the Sangalla’ district, about 23 km from the hotel. There is a natural cave with ancient wooden coffins and effigies. Is situated 24 km south part of Rantepao , in the Sangalla’ District. Here are the houses of Puang Sangalla (noble class) which is used as the government center in ancient times. There is a small museum of royal possessions belonging to the local noble class. The valley is 1200 m up to the mountains above Polewali, the Mamasa region - formerly as Western Toraja, the other wonder of Toraja within the landscape of terraced hills with easy hiking to numerous traditional villages, with friendly of people. 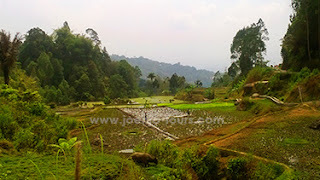 Four day hiking trail from Tanah Toraja or Mamasa. No luxurious hotel available in this town. Located about 28 Km from Rantepao, is a place where you can see the other unique life style of Torajan, which is the corpses buried in the trees. The grave is special for the baby who death before teething. - Air Asia : Kuala Lumpur - Makassar - Kuala Lumpur - Sunday, Monday, Wednesday, Friday. - Garuda airlines : Singapore - Makassar - Singapore within daily flights. - Silk air from Singapore - Manado - Singapore : Monday, Wednesday, Friday, Saturday. JAKARTA ( Java ) - MAKASSAR ( South Sulawes i) - Two hours, twenty minutes flights, by Garuda Airlines, Lion Air, Batik air, Sriwijaya airlines - This route is helps passanger to start the Sulawesi tour from Makassar to Bira beach , Sengkang regency, Karst Ramang ramang - Pare Pare then Tana Toraja..
JAKARTA ( Java ) - MANADO ( North Sulawesi ) Three and half hours flight by Garuda Airlines, Lion Air, Batik air, Sriwijaya airlines - From Manado the journey you can start within Bunaken Marine National Park - Tangkoko Nature Reserve - Minahasa Regency also can do land transfer to Gorontalo where the harbor for Togean Island. Drive for 09 hours. JAKARTA (JAVA - PALU ( Central Sulawesi ) Three hours flights by Garuda airlines and Lion Air, Sriwijaya air, Merpati airlines. JAKARTA - GORONTALO ( Gorontalo ), Three hours and fifteen minutes by Garuda airlines, Lion air, Sriwijaya air.